Camping is a recreational activity and is not a one-type-fits-all situation. An air mattress might be good for your backyard camp out but bad as you backpack into the wilderness. There’s a big difference between sleeping pads and air mattresses, and in this article you will discover the pros and cons and which one is right for you and your trip. A sleeping pad is known by many names (roll pad, sleeping mat, ground pad, etc) but “sleeping pad” is the most common. The most simplest, rugged and cheapest of them all is the closed-cell foam sleeping pad. Insulation consists of foam with an outer protective layer, and nothing more. There are many available that come in all different shapes, sizes and comfort ratings, but at the end of the day they need to be strapped to the outside of your backpack since they aren’t compact enough to fit inside. Self-inflating sleeping pads were created back in the 70s and one of the most common in the modern age. It’s just a matter of unrolling the sleeping pad, opening the valve then watching the foam “absorb” air, which fully inflates in a matter of minutes. 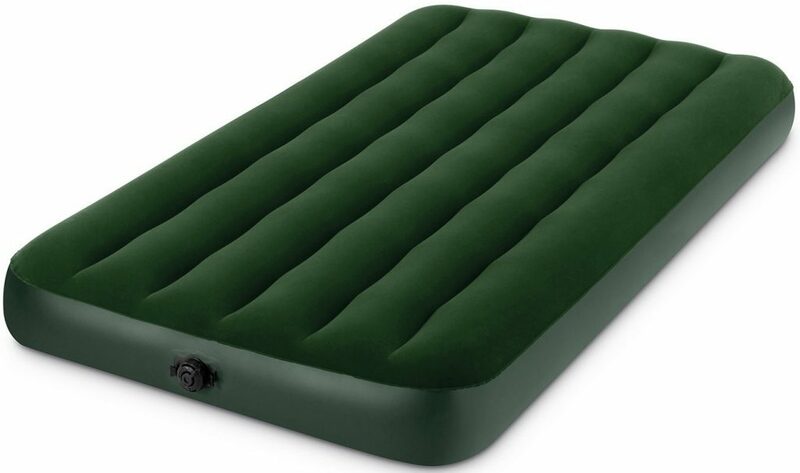 There is no air pump needed with these types of sleeping pads. They are more comfortable, compact and lighter than closed-cell foam sleeping pads; making them a good choice amongst hikers and ultralight backpackers. These are the type of pads that have all the features and bells and whistles but typically weigh more, require manual inflation and have a big comfort/insulation ratio problem. With manual-inflating sleeping pads you have to blow them up with your mouth or an air pump. There’s a certain challenge when it comes to manual-inflating pads, the fact that it’s not easy to balance comfort and insulation together. For example: A sleeping pad with baffles (for comfort) sacrifices some of its insulation abilities. On the other hand, the more air it has the less insulation it provides. These types of sleeping pads usually require lots of research before purchasing just to ensure it is 100% right for you. All sleeping pads are given a R-Value, and it’s very inaccurate at best. Basically, they base their R-value off of an average man and woman, who they assume to be 25 years old and of average height and weight. However, everyone has a different age, weight and size and it leads people to believe they are getting the correct sleeping pad for them when this is simply not 100% correct. So R-value is just a baseline and by no means not to be taken in full effect. As a rule of thumb: The higher the R-value the more warmth the sleeping pad provides and the higher the cost. Affordable – you can find foam sleeping pads for around $10! 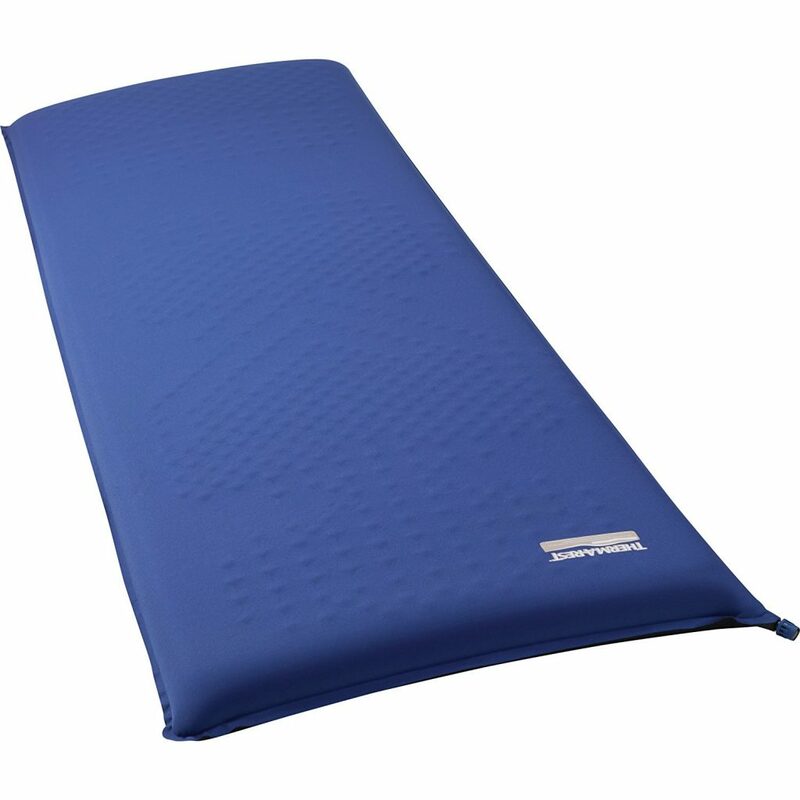 A sleeping pad is highly versatile and more common than air mattresses. The fact that there are so many available, they are inexpensive and can be taken pretty much anywhere makes them a no-brainer when it comes to the outdoor world. So many people use sleeping pads since they are lightweight, compact and affordable while offering great warmth from earths cold ground. An air mattress purely consists of air to provide a good distance between earths cold hard ground and your body. There is absolutely no foam inside and the reason it is called an “air” mattress. Other names known by include: blow-up bed, air bed, inflatable mattress. They are very buoyancy, and as a result they are sometimes used as a flotation device. However, more times than not they are used for camping. Due to the latest technology, most are self-inflating and only require a wall outlet to inflate (with an electric pump). Cheaper ones will need to be inflated via orally or a hand pump though. Air mattresses are not as versatile as sleeping pads for the simple reason that they are much heavier. They are at risk of deflating during the night and can be punctured. Although that’s not to say they don’t hold their place in the camping world because they absolutely do. They are AMAZING when weight won’t be an issue, so when you’re driving to your campsite or in your backyard. They are also best suited for larger people since air mattresses have less chance of bottoming out. 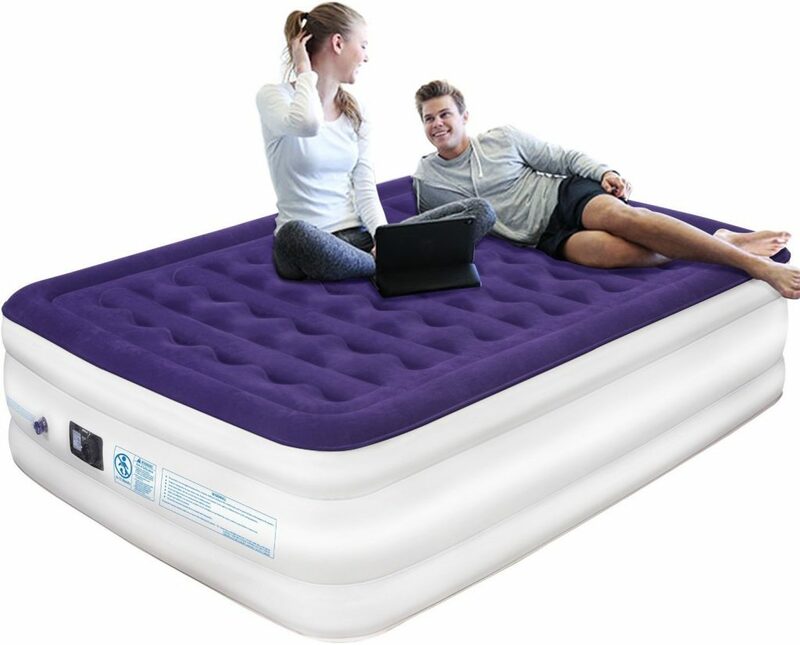 An air bed is simply an air mattress which is designed to look like a real bed. It has an increased height and creates a more luxurious feel while out camping since it feels like you’re sleeping on a real bed and not a mattress. I’ve already reviewed 15 of the best air mattresses on the market! There are many benefits to air “beds”. When it comes to sleeping pads and air mattresses, the choice comes down to what you’re using it for. I’ve placed recommendations under each one so you know what it’s “best recommended for”. Basically, a sleeping pad is good for you when you need something lightweight, compact, versatile, easy-to-use and affordable. This is great for wilderness excursions or anytime when weight is going to be an issue and every ounce matters. On the other hand, an air mattress or air bed is more suited for you when weight doesn’t matter. This is the better option when you’re driving to your campsite, family event, backyard camp out or something similar. Well I hope I broke down everything so you understand the difference between the 2 mattress options (or 3 when you include the bonus). If you still need help, talk to me in the comments below! I’d love to hear from you. I feel like a sleeping pad would be much better! Honestly I had no idea that was a thing before reading this but now I’m glad I do! I hate the feeling of rolling around on an air mattress, i always wake up with a sore back lol! I live in an area with a lot of campgrounds so when i decide to actually go i’ll have to grab a sleeping pad! thanks! Each have their pros and cons but both are good in my opinion. It really depends on the type of camping trip you’re going on before you can decide which one is good for you. Good luck on your future camping trip my friend. I love camping and I often go out in the nature with my friends. To be honest, i personally prefer the sleeping pad simply because it is more comfortable to carry and use. And it doesn’t require labour in order to use it. You just put it on the floor and that’s it. My wife, however prefers sleeping on a mattress because she likes to feel like a princess. You’ve made a very nice comparison and I agree with all you say. Well thank you Asen. There’s nothing wrong with either one, it just depends on your specific needs and type of trip, and everyone is different. You choose what you like, there is no one-size-fits-all decision here. Cheers for the comment. 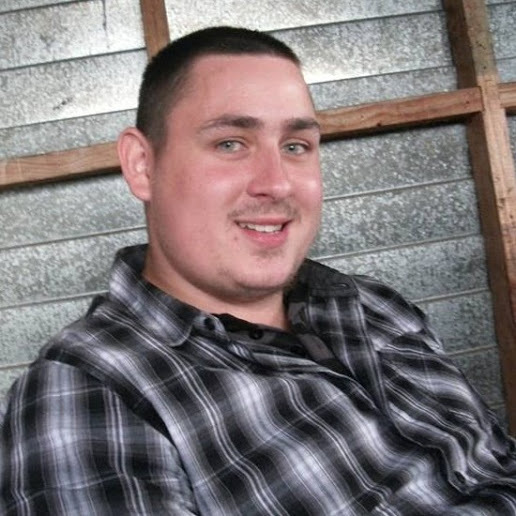 Thanks Brandon for your article it’s very informative and I was actually planning to go on a hunting trip sometime this year most probably in October I think I may want to try out a sleeping pad this time. Good luck buddy. I also think you should go with the sleeping pad since it’ll be less bulky and easier to use. Camping is a job in itself. Personally, I don’t want to inflate an air-mattress with everything else that has to be done. Sleeping pad for me. However, I didn’t see a pro/con list for the air-bed. That looks comfortable, but quite bulky. What are your pro/con opinions on that? That’s a great idea Lane. And camping is a job depending on what type of trip you’re embarking on. I know some glampers take their whole house with them (not even kidding or exaggerating). I mean, each to their own but I would rather stay the minimalist route and be set up in 20-30 minutes – not 2-3 hours – and be relaxing or on my first adventure. I found your post extremely informative. I don’t camp very often, but I didn’t realize there was a choice, thank you! I really liked that you took the time to really explain them both and give the pros and cons. We went camping a lot when I was a kid. When I was older my parents bought a couple egg tipped type of foam pad. Even as a teenager it was a bit narrow. It was far better than any air mattress I have used since. I find that the air mattress’ always lose air through the night. I would get cold on the air mattress’ faster than I ever did with the pad. Since my accident last year I prefer to go in style (camper of course). However, I always went to many classic car shoes to advertise for my custom chrome shop. Camping was always cheaper than hotels and it always brought me back to my roots. There’s a lot of trouble with air mattresses and that is exactly why people don’t like them. You run the risk of waking up on the floor and cold because you’re not safe from the earths cold ground anymore. I love the fact that you’re all about the foam pad and know that it’s your weapon of choice every time. I’ll be using a camper in the future but for now while I’m young I’m going to stay in a tent.